Fictional teen sleuths Frank and Joe Hardy are the sons of the celebrated private detective Fenton Hardy, an ex-NYPD ace gumshoe, and his wife, Laura. Visiting or living with them (depending on the book) is Fenton's elder sister, "Aunt" Gertrude Hardy. They reside in an unspecified Northeastern state's seaboard city of Bayport, located near the Atlantic Ocean on Barmet Bay. The Boys are highly mobile and have a car, motorcycles and a motorboat, The Sleuth, and seemingly unlimited funds to take plane trips and the like. Frank and Joe are accompanied on all their adventures by their particular chum, the chubby farmboy Chet Morton. Their other chums are Biff Hooper, Tony Prito, Phil Cohen, and Jerry Gilroy. Frank and Joe date, respectively (and respectfully), Callie Shaw and Iola Morton, the sister of Chet Morton. The Bayport Police Department is represented by Chief Ezra Collig, Patrolman Con Riley and, in the early unrevised stories, Detective Oscar Smuff. The Hardy Boys were thought up in 1926 by Edward Stratemeyer and his Stratemeyer Syndicate, which then advertised for ghostwriters to write the stories from outlines provided by the Syndicate. Leslie McFarlane answered the advertisement and would wind up writing the first sixteen volumes of the series and volumes 22-24. The Syndicate also created Nancy Drew, Tom Swift, the Rover Boys and dozens of other memorable characters. Since the release of the first three "breeder" volumes of the original Hardy Boys books in May 1927 (copyrighted May 16) by New York publisher Grosset & Dunlap, the Hardy Boys have never gone out of print and they remain popular today with close to 500 titles published across several different series. Starting in 1959 the first 38 stories were revised and abridged, much to the dismay of long-time Hardy Boys fans. The books were shortened from 25 chapters to 20 and had a more uniform length to reduce publishing costs, obsolete prose, which dated the stories, was updated, and racial stereotypes, the subject of many letters of complaint, were eliminated. Revised titles from The Secret Panel to The Mystery At Devil's Paw were merely edited down to size from the original titles. Although the stories were given the same titles and some of the plots remained basically the same, many books were given new plots and are unrecogizable from the originals. Unfortunately, the quality of the writing was nowhere near as high as in the unrevised versions and the resulting stories lost much of their original charm. After the 1979 court battle in which Grosset & Dunlap lost the rights to publish any new Hardy Boys tales, Simon & Schuster started publishing new stories in paperback format (the Digests), although Grosset & Dunlap retained the right to print the original 58 stories (the "canon") and the Detective Handbook. The Digest series continued until 2005 when it was replaced by the Undercover Brothers series, which ran to 39 volumes and ended in 2012 when it was replaced by The Hardy Boys Adventures in 2013. In addition to their solo adventures in the original stories and the Digests, they have joined forces with Nancy Drew in two Supermystery series, the two volume Super Sleuths series and the Be A Detective series and with Tom Swift in the short-lived Ultra Thriller series. They also spawned several spin-off series (Casefiles, Clue Books, The Clues Brothers, Secret Files, Undercover Brothers Graphic Novels), in addition to many other books such as The Detective Handbook, Ghost Stories, activity books, a coloring book, etc. 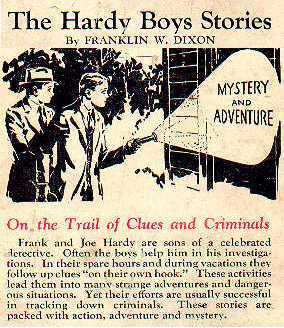 Their adventures continue in two series of paperback books (The Hardy Boys Adventures and Clue Books) as well as the hardcover books published by Grosset & Dunlap. The Hardy Boys have become pop culture icons and have spawned 4 TV series (including an animated cartoon series) in addition to many other media appearances including comic, coloring, activity & puzzle books; stage plays; games; toys; records and many other collectible items. The Hardy Boys mysteries is the best selling & longest running series of books for boys and has been published in many languages world-wide. The pseudonym Franklin W. Dixon was also used on the 20 volume Ted Scott Flying Stories series, 1927 to 1943, and the short-lived (1992-1993) Tom Swift crossover Ultra Thriller series. New & out of print Hardy Boys books, CDs, DVDs, games & other items are available from Amazon.com or their 3rd-Party sellers. Your purchases make this site possible - thanks! Cover art for the Original Series, British books, Digests, Case Files, Undercover Brothers, Super Mysteries & Clues Brothers. A guide to each of the 58 original books and the 38 revisions. The authors, artists, publication and revision dates, brief plot summaries, format guide, revision history, DJ types, 1st PC Editions, & other information. Detailed information on the 50's Mickey Mouse Club serials, the failed 1967 pilot show, the 1969-71 animated series, the 1977-79 ABC series & the 1995 syndicated series. An illustrated guide to all the other Hardy Boys books. Plot summaries, cover art, publishing information & more. Detailed illustrated information on Hardy Boys memorabilia & collectible items such as games, comic books, records, jewelry, action figures, activity books & more. Frequently Asked Hardy Boys Questions: History, Authors, Who's Who, Checklist, Scarce Editions, Reference Books + More. A detailed guide to the Hardy Boys books published in Great Britain. Discuss The Hardy Boys with other fans from around the world. Keep up-to-date on all the latest Hardy Boys news with groups on Yahoo, Facebook, Google+ and Twitter. Links to other Hardy Boys sites and resources. The Hardy Boys News is updated monthly and has been delivering all the latest Hardy Boys news, Hardy Boys book reviews & articles and much more since 2005. The original Hardy Boys Webzine from 1997 to 2005 - Hardy Boys reviews, articles, humor and more. NEW! My own sales page with boys and girls series books. Since 1996, The Hardy Boys Unofficial Home Page has been the premier spot on the internet for adult collectors and fans of the Hardy Boys mystery books by Franklin W. Dixon. There is detailed information such as authors, illustrators, artists, plot synopses and more on every Hardy Boys book, including all paperback series, with full color images of the cover art for all series. A News Blog is updated monthly. Social media groups on Facebook, Yahoo, Google+ & Twitter make it easy for fans to get together and swap information, look for books, etc. This site was a labor of love for me. Growing up in the 50s, I was entranced by the Hardy Boys and read them voraciously. They started me on a life-long love of mystery and reading, for which I will be eternally grateful.